Summer is the time for boat trips and islands. 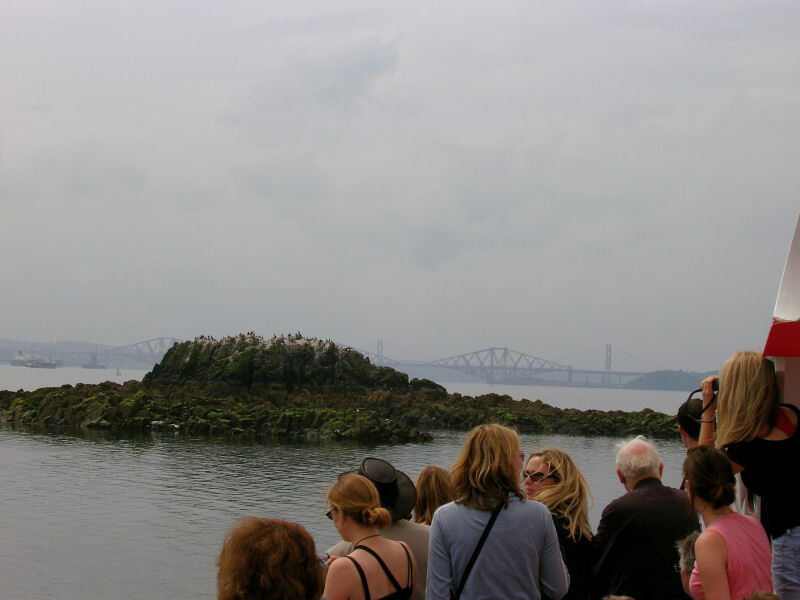 The premier trips in the Forth are to the Isle of May and to Bass Rock: I've tried a couple of times to book a trip to the Bass but the swell has always been too bad. Closer to shore, and less affected by the weather, is Inchcolm. 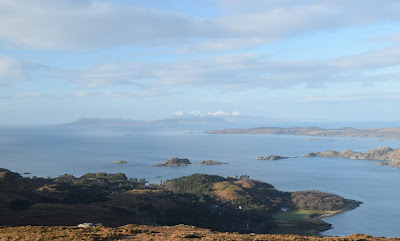 This island is named after St Columba (Colm Cille in Gaelic) who supposedly visited around 567. A now-ruined monastery was named after him. 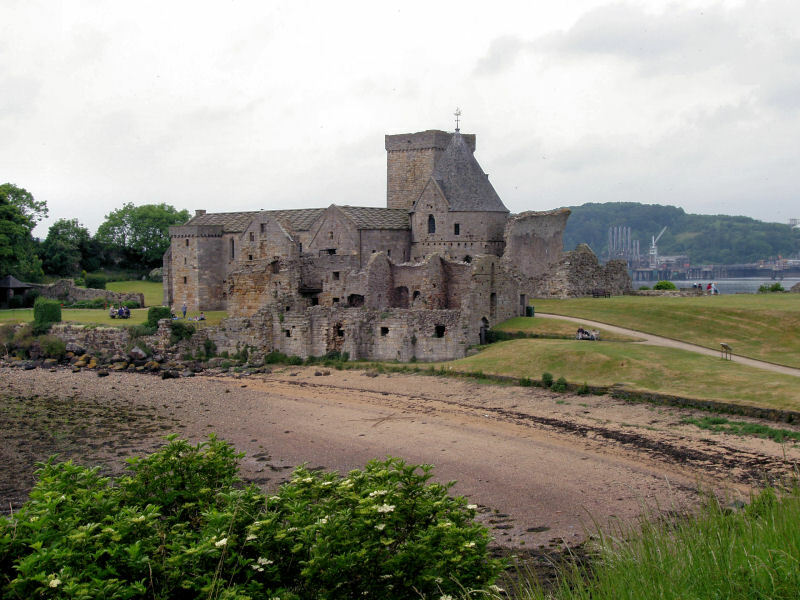 It was built in the 12th century after Alexander I's boat was blown onto the island and he was taken care of by a hermit. 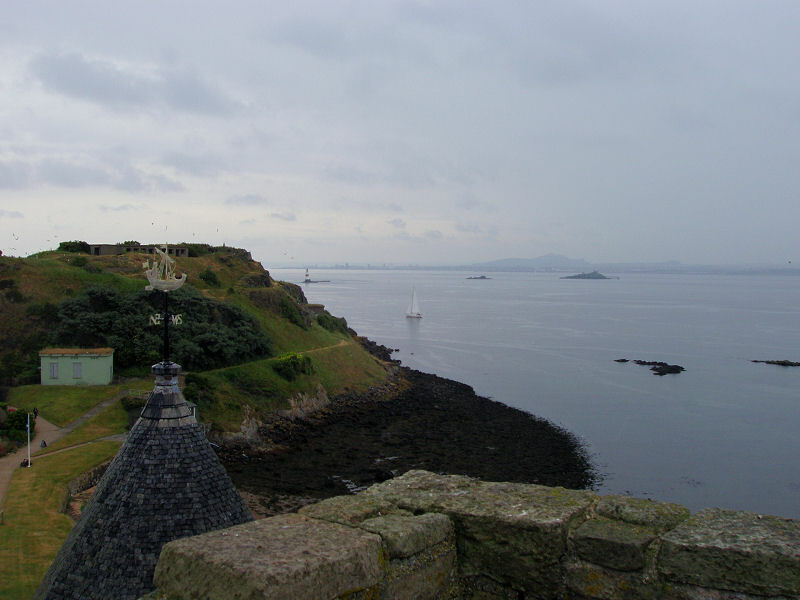 Inchcolm, although close to the Fife shore, is most easily reached by boat trip from the slipway at South Queensferry in Lothian. 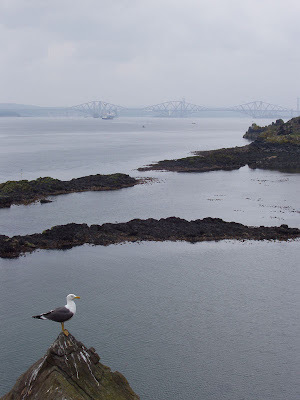 We boarded the Maid of the Forth, a holiday atmosphere prevailing despite the dull-ish weather (perhaps the pint in the 17th century Hawes Inn beforehand helped). 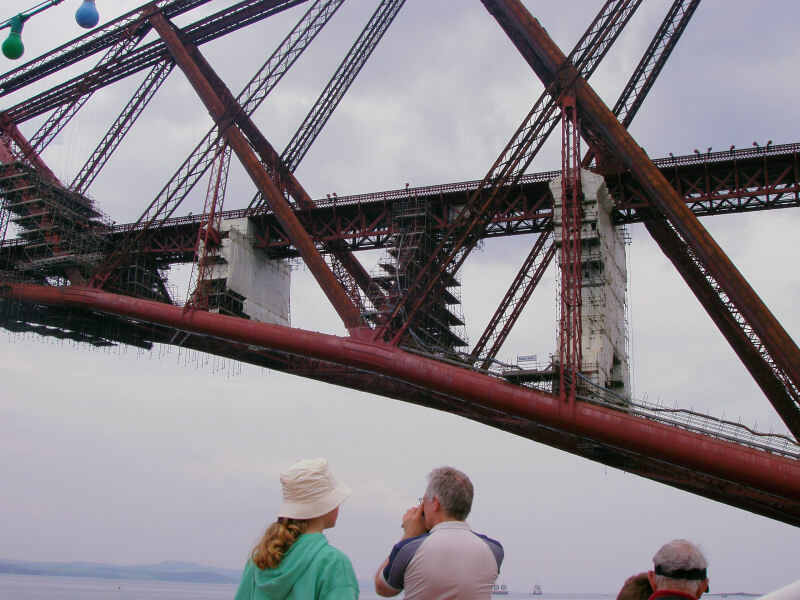 First the boat sails under the gargantuan girders of the Forth Bridge, before passing a couple of rocks and ending up at Inchcolm, where an exploration of the monastery can be made. I had thought the monastery would be the main attraction of this tiny island, but it isn't. Inchcolm is uninhabited and only occasionally visited by people. Except for the small area of the monastery precinct and landing pier it is given over entirely to herring gulls. 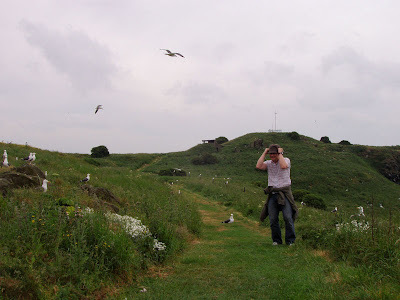 In the absence of rats on the island, the gulls nest on the ground and take great exception to intruders. I don't know if you have ever experienced the aggression of a bonxie attack in the Northern Isles? 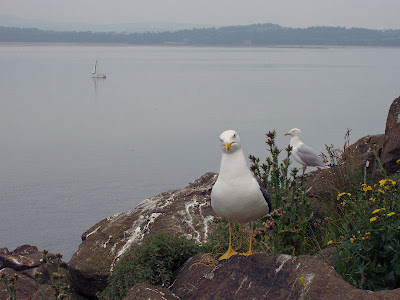 The gulls of Inchcolm are made from a similar mould. The gulls make it plain, by divebombing your head, that excursions furth of the monastery are not welcome. The further you intrude into their territory, the more aggressive they become. Eventually you realise it is not worth trying to reach the western end of the island, although the path round the eastern end can be endured. After the attacks of the gulls, it was a relief to reach the sanctuary of the monastery and get back on the boat. Another few pints in the Hawes Inn and the train back to Edinburgh completed the day trip! 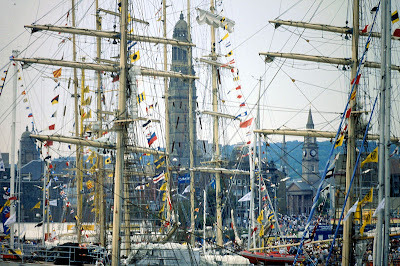 The Tall Ships Race called into Greenock this weekend - I had wanted to make it along on Saturday but other commitments reared their head so these pictures are from the last time they berthed at Greenock in 1999 - fortunately the weather was just as good this weekend. A shame I am now in the east coast where Edinburgh endured flooding on Friday and Saturday! In 1999 I took the MV Kenilworth across the water from Helensburgh to Greenock. 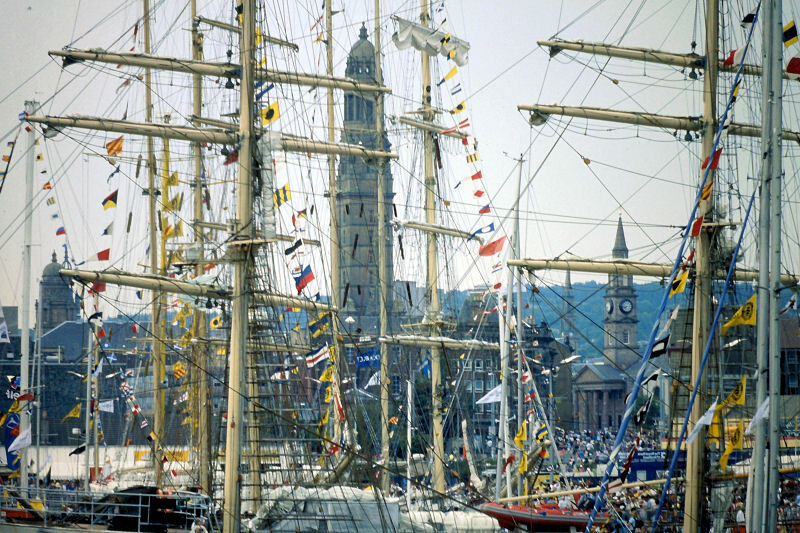 This seaborne approach is the best way of all to arrive at the Tall Ships Race, an emoillient sea reflecting endless blue skies and the forest of masts and bunting out-peacocking Greenock's famous town hall. This was not the same grey-green Clyde of dull light and raw watery winds with which a local might associate the area. This was the Clyde putting on its best weather for the towrists. 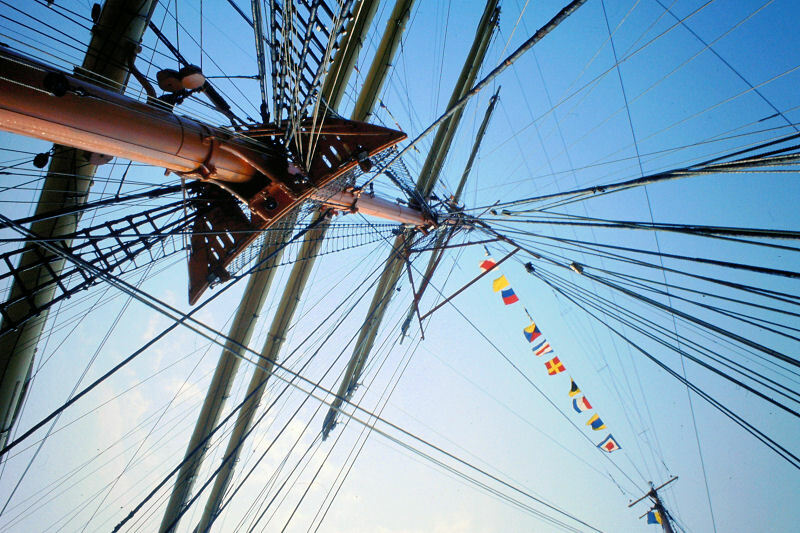 There was a band, a beer hall, children's entertainment, stalls: but the chief and only atrraction, as far as I was concerned, were the boats. Boats from Europe, South America, Russia: huge, immaculately scrubbed and polished boats, with wooden decks, canvas sails, brass fittings. Some had smartly turned out crews in naval cadet style uniforms: others were more relaxed, barefoot and drinking beer. 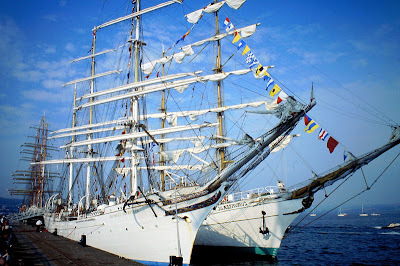 The grande dame of the Clyde, the Waverley, was also doing trips to the Tall Ships. The whole river was in festival mood, sunny Greenock the epicentre. On board one boat - I can't remember which - they were looking for crew to sail the next leg to Lerwick. Did I want to give it a go?! I considered an impromptu week's holiday from work. But there was a catch - it would cost a fortune. What an experience it would be but, cautious to the core, I declined. A well-fed man in cherry-picker trousers and shiny shoes takes off his jacket to reveal braces underneath. Another man stoats by with an 18-inch feather in his hat and a longbow. Military dress uniforms or show suits for the men, floral dresses and pastel coloured hats for the women. An upper-class voice is talking about the shooting this year. This is outside in the car park with little picnic tables set up behind 4x4s - nobody is inside the palace grounds yet as the party doesn't kick off till 3pm. The non-military, middle-class men are obvious as they wear kilts - white socks and tweed jackets for the older men, dark green or black socks for the younger, sweltering in the brief summer heat. Young women in floaty dresses and just-done hair kick off their heels and walk across the grass flat-footed. Inside the Queen will meet a couple of people, picked by flunkies for a brief chat, but most will get at best a distant glimpse of the monarch, her inscrutable duty face softening a little as she meets real people. The area of Holyrood Park we normally use for our lunchtime sports practice has been fenced off, patrolled by car park attendants, metropolitan police and the army, who wander over discreetly to check up on a man they've been watching who is sporting a rucksack and babbling to himself about demons. He wanders on, away from the VIPs, and they back off. No doubt if we looked hard enough we'd spot the snipers on the rooftops. It's the Queen's annual garden party at Holyrood Palace, free tea and sandwiches and hob-nobbing with the old money and nominated worthies of Scottish society.